Samsung's new Galaxy Tab S4 tablet sports Dolby Atmos and AKG speakers | What Hi-Fi? Samsung's new 10.5in tablet is big on practicalities, and supports Dolby Atmos. We’re still a week away from Samsung’s Galaxy Note 9 smartphone launch, but that hasn’t stopped the Korean giant announcing other new members of the Galaxy family in the meantime. Today, it has lifted the lid on the Galaxy Tab S4 tablet, the replacement for the Galaxy Tab S3 (a What Hi-Fi? four star review). While similar in size to its predecessor, the Galaxy Tab S4 narrows those bezels, which frame a 10.5in Super AMOLED 2560 x 1600 screen - slightly up from the Tab S3 in both size and resolution. Elsewhere it’s driven by Qualcomm’s Snapdragon 835 Octa Core, runs Android 8.1 Oreo, includes 4GB of RAM, and houses a 7300mAh battery (up considerably from the Tab S3's 6000mAh one) that promises up to 16 hours of video playback from a single charge. Unsurprisingly, there’s now a ‘refined’ S Pen stylus in the box, too. The new news, however, is that it’s the first tablet to be compatible with Samsung DeX, which until now has only worked with the Galaxy S8/S8+, Note8 and S9/S9+ smartphones. DeX essentially allows the Galaxy Tab S4 to connect (and power) a monitor, keyboard and mouse for a desktop experience, giving users the option to switch from the Android interface to a desktop one. A connected monitor (via the Tab S4's USB type-C connection) can mirror the tablet screen, or be used in 'Dual Mode' so you can use the two screens independantly of one another. For example, you can watch a video on the screen it's attached to while writing notes on the tablet. Elsewhere there are also four new built-in speakers tuned by AKG and support for Dolby Atmos, plus a 13MP auto-focus rear camera and 8MP front camera. 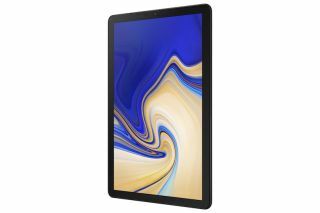 The Samsung Galaxy Tab S4 comes in a choice of black or grey, and 64GB and 256GB storage options (both can be expanded up to 400GB with a microSD card). The tablet is available from 10th August, and will cost £599 (WiFi model) or £649 (LTE model).